Brighten up your spring with a day trip from Seattle to the annual Skagit Valley Tulip Festival, one of the most magnificent floral displays in the US! Admire the vibrant, vast tulip fields on a leisurely stroll, and stop to chat with the tulip growers and purchase some eye-catching flowers. This stunning spectacle is sure to amaze your senses! Your tour will also include admission to the breathtaking gardens at Tulip Town and Roozengaarde, where you can wander through row after row of rainbow-hued tulips. Then, enjoy free time in the charming village of La Conner (1 hour and 15 minutes north) to browse boutiques and galleries, visit a museum or take a nature walk, letting you soak up the idyllic Northwest atmosphere. This tour only runs in April, so book now! You’ll be picked up from the Museum of Popular Culture in the morning and taken on a comfortable drive north to Skagit Valley to experience one of the most magnificent floral displays in the US. 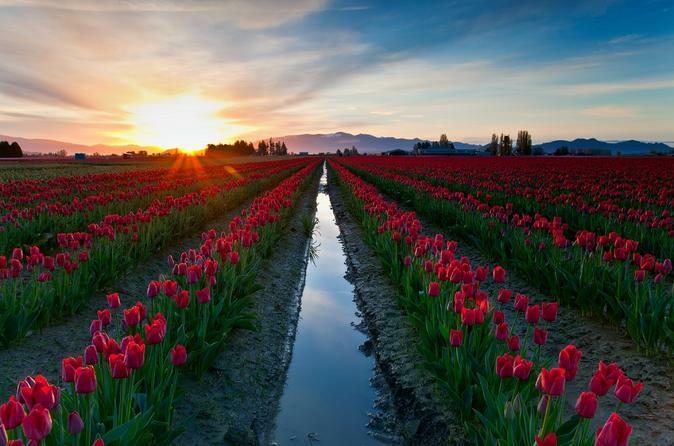 Arriving at the annual Skagit Valley Tulip Festival, you'll experience a spectacle of more than 1,000 acres (405 hectares) of brilliant, multi-colored tulip fields and gardens. During your time here, feel free to chat with the tulip growers, buy some field-fresh flowers and order bulbs to grow your own tulip garden. You’ll also visit the breathtaking gardens at Tulip Town and Roozengaarde. Have your camera ready as you wander through row after row of rainbow-hued tulips. Afterward, hop in the coach and continue driving to the nearby scenic and historic waterfront village of La Conner. A delightful mix of small-town charm, outdoor beauty and culture, this quaint place captures the Northwest spirit. Enjoy time at your leisure and expense to browse the local boutiques and galleries, grab lunch, watch for wildlife along the water, visit one of the several museums, walk the trails of Pioneer Park, or stroll along the Rainbow Bridge to snap some keepsake photos. After your time here, it’s back to Seattle!